While Jackson’s extended editions are usually the “go to” choice when choosing on film editions, The extended edition of The Hobbit: The Battle of the Five Armies can’t help the film from being just a 164-minute coda to a trilogy that was already complete. After a long perilous journey fraught with ogres and dragons, our precious groups of dwarfs, hobbits, and viewers have finally arrived at the culmination of Peter Jackson's Hobbit trilogy, The Hobbit: The Battle of the Five Armies. And luckily, the extended edition Blu-ray comes out just in time for the 2015 holiday season. Last time we saw our band of weary travelers, Bilbo Baggins (Martin Freeman; Sherlock), Thorin (Richard Armitage; Hannibal), and the band of dwarves had just unleashed Smaug (Benedict Cumberbatch; Sherlock Holmes) on the unsuspecting town folk of Laketown in an attempt to take back their mountain stronghold. Picking up the exact moment The Hobbit: The Desolation of Smaug left off, The Hobbit: The Battle of The Five Armies shows the plight of the people of Laketown as they battle Smaug and eventually defeat him. With nowhere to go, the people of Laketown turn to the dwarves for refuge, as well as payment for their services. However, Thorin, now consumed by dragon sickness, refuses to allow them entry or any type of payment. Aside from the humans coming to now take over the stronghold, a battle of five armies soon arrives, ready to do battle for what is to become a defining moment in the history of middle earth. While Peter Jackson's (Lord of The Rings Triology) extended addition of the film usually adds additional plot points to the story, the 164-minute, R rated cut of the film The Hobbit: The Battle of the Five Armies can only do so much. It adds a few snippets of dialog here and there, and a little more blood and guts, but, on the whole, the film feels even longer and more pointless than the theatrical edition was. Aside from the destruction of Smaug, which should have been part of the second film in the trilogy, there just isn't anything to really care about with this ending. Yes, we get the battle of the five armies, but do we really need over an hour and a half battle to complete the film? Just like the rest of the The Hobbit series, The Hobbit: The Battle of the Five Armies is pure eye-candy when it comes to video. The 1080p/AVC-encoded video is impeccable. Due to Peter Jackson's look and feel of Middle earth, colors are muted and washed out, but this does not take away from the fact that this disc is the perfect "demo quality" picture to showcase your home entertainment theater. The DTS-HD Master Audio 7.1 track of The Hobbit: The Battle of the Five Armies is a treat unto itself. Every sword clash or grunt from the battlefield comes through in amazing clarity. And, while this sound usually dominates the soundtrack, the dialog is never muffled and can be heard crisp and clear. The real treat for this extended edition of the movie is the two Blu-ray discs containing over 9 hours of appendices and extras to the film and the trilogy. Included in this collection, and the most noteworthy of the additions, are The Appendices Part 11: The Gathering Storm, The Appendices Part 12: Here at Journey's End, Ain't It Cool News birthday video, a look at Adam Brown, Rivers of Gold music video, and a tribute to the late Andrew Lesnie. If New Line and Peter Jackson had stuck to their original plan of just two Hobbit films, The Hobbit: The Battle of the Five Armies would never have had become a reality, and the series as a whole would have been wrapped up much tighter. 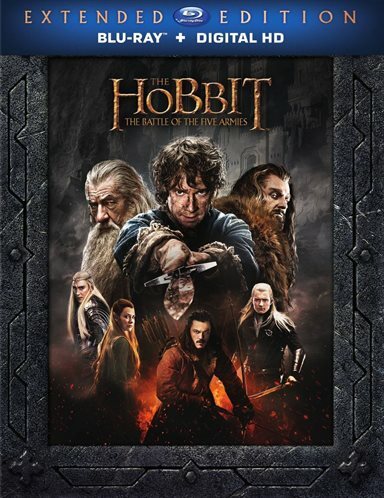 If you are a fan of the series, or someone that likes to complete film sets, then this film is a must for your collection, and while Jackson's extended editions are usually the "go to" choice when choosing on film editions, The extended edition of The Hobbit: The Battle of the Five Armies can't help the film from being just a 164-minute coda to a trilogy that was already complete. I give The Hobbit: The Battle of the Five Armies 5 gold pieces in production value and an amazing box set, but only 2 gold pieces for the film itself. The outcome? 3 and half gold pieces. Download The Hobbit: The Battle of the Five Armies Extended Edition from the iTunes Store in Digial HD. For more information about The Hobbit: The Battle of the Five Armies visit the FlickDirect Movie Database.